Do you have a specific memory that stands out in your mind when you were young? 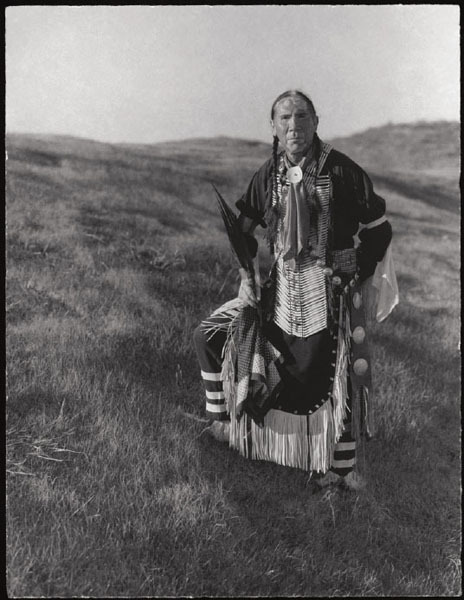 "I remember living out in the country in a frame house where in the winter we traveled by horse and sled to the round dance hall where we did our social drumming and dancing. During those early years as an innocent child, isolation from the dominant society allowed for deep introspection into who I was before I started going to structured schools." How is your life different from your parents or grandparents? "Like my parents and grandparents, I grew up adapting to rules of living from public school and Christian religion. During those early years I was distracted from practicing certain traditions and rituals but I was fortunate to have a father and mother who allowed me to return home at different times in my life to participate and learn ceremonial processes." What traditions from the past do you still continue to practice? "Early in my life I did not realize that I was being imprinted by the behavior and example of my grandfather who in his own quiet way schooled me in what it means to be respectful. That is hard to retain when those around you are taught that competition and conquest are more important than the Christian golden rule. As a rule of thumb today, I strive to stay teachable amidst a world bent on self-reliance through corporate global expansion. The old ways teach us the benefit of cooperation and peaceful co-existence, but it is hard to practice them when you have to live in two worlds." What was your impression on having your photograph taken? 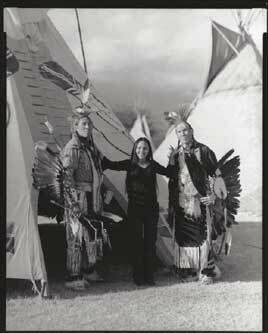 "Gary Auerbach and I met at a Pow Wow in 1999 on the San Carlos Indian Reservation where he asked me to pose for him with his Edward Curtis-style camera equipment. Even though the finished photographs speak for themselves, I have to commend the photographer for the sensitivity and devotion he has shown in seeing his subjects as real people. In our fast moving world, the traditions of Native Americans often go unnoticed and it is people like Gary Auerbach and others that take the time to show the rest of the world that American Indians continue to make a place for themselves in a changing world." "Our forefathers still whisper to us through the spirits that when the "sacred hoop is mended" then and only then will man be able to overcome the prejudice that has been around for a long time. And again, I heard it once said that to 'change the man is to change the world' but it takes one, then two and then more to bring this to pass." © 2007 Gary Auerbach. All rights reserved.